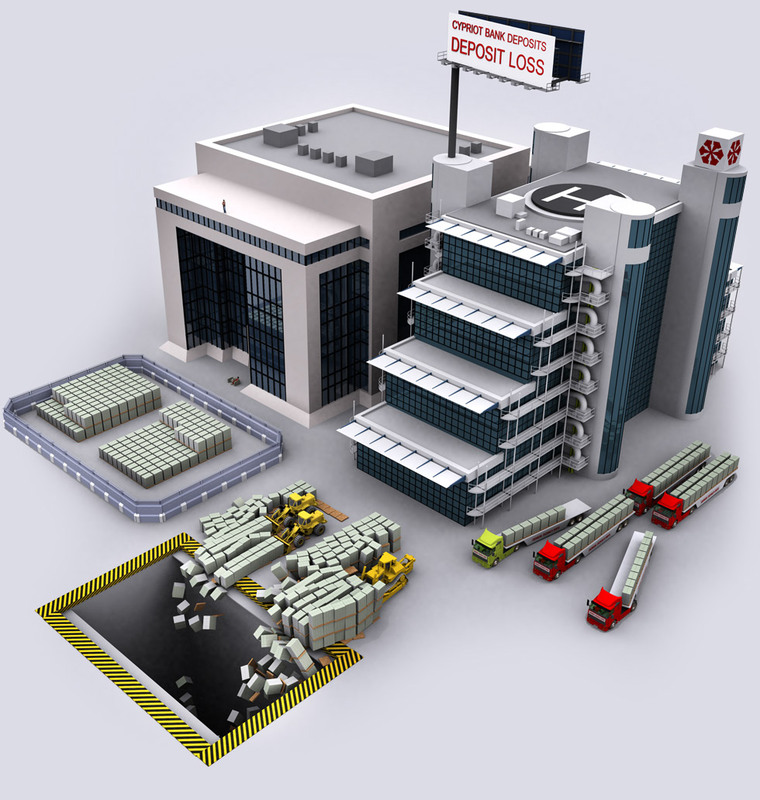 This infographic visualizes the Cyprus bank crisis and failing bank deposit confiscation. 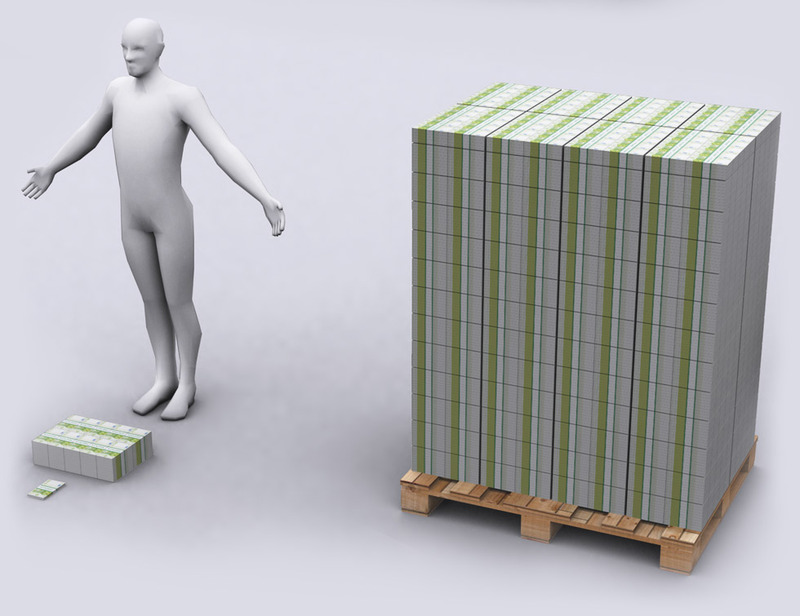 €100,000,000 - Approximately the size of the bonuses that CEO's of big banks got during the financial crisis. "Whoever controls the volume of money in any country is absolute master of all industry and commerce." -James A. Garfield, President of the United States. 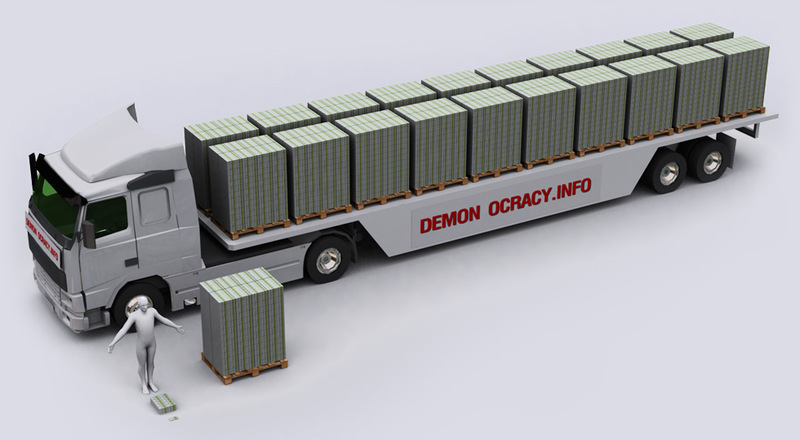 €2,000,000,000 - Cyprus Economy is €19.3 Billion, roughly 10 of these trucks. The Cypriot Government could not bail out its banks due too high debt-to-GDP ratio & Cyprus' oversize banking sector. The people of Cyprus could not bail out its two failing banks - Bank of Cyprus and Laiki Bank (a.k.a. Popular Bank). 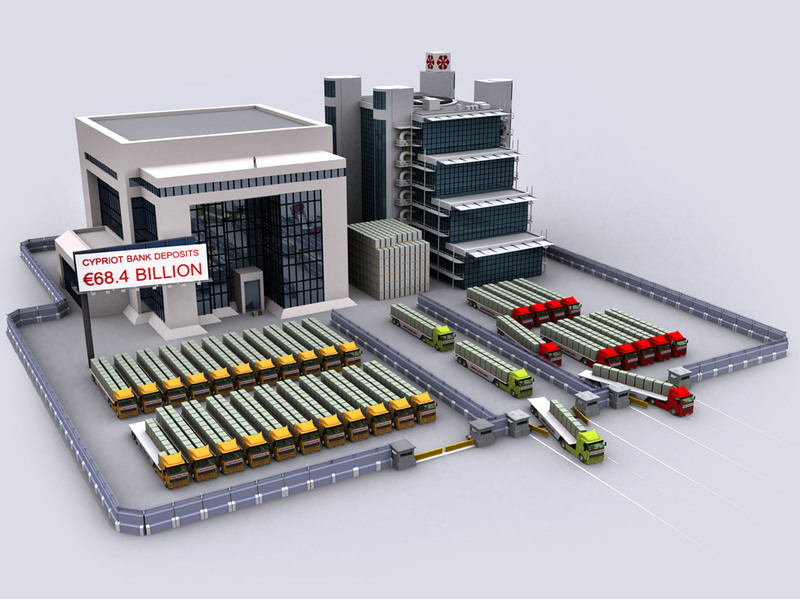 The size of the Cyprus banking system at €150 Billion over-shadows the nation's GDP at €19.3 Billion. Bailing out the banks would put Cyprus in same position as Greece. 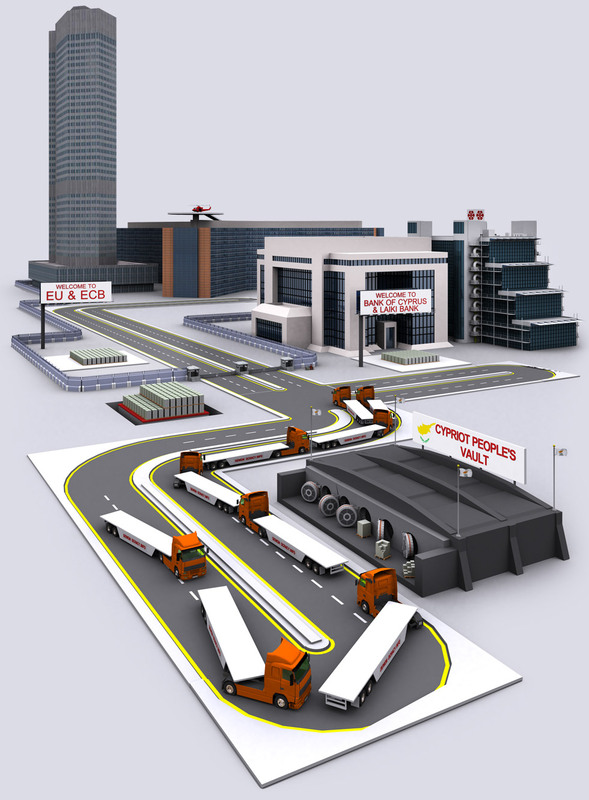 If you are confused about the trucks - The Cypriot Government debt is shown on the semi-trucks. This graphic shows why Cyprus could not bail out its banks. The deposits by Bank of Cyprus and Laiki Bank are too large for the small country with only €19.3 Billion GDP to bail out, especially considering the €15 Billion in debt they already have. Instead they asked for €17 Billion from EU/ECB to finance the broke Government and bankrupt banks. 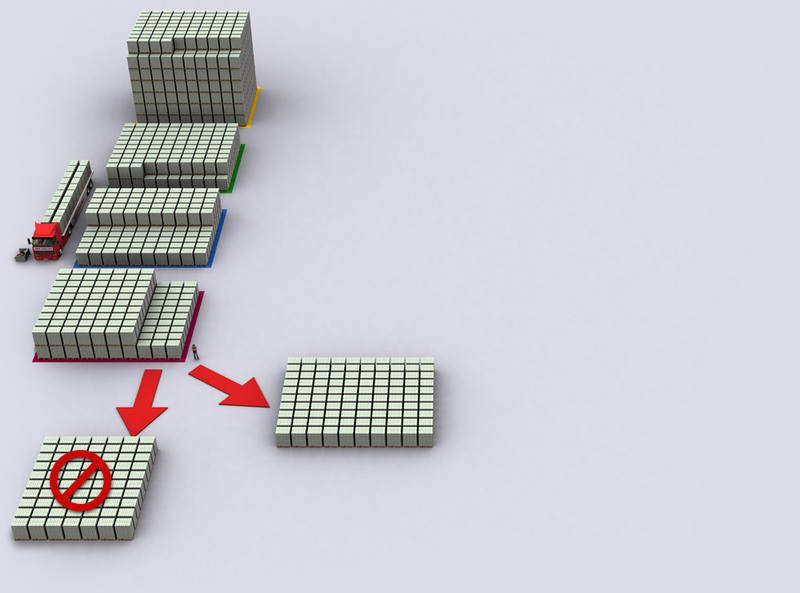 €7 Billion out of the €17 Billion was intended to go to stabilize Banks, but per “final deal” the €7 Billion won’t come from ECB/EU but from Bank Depositors (shown in graphics below). The banks started to fail once they had to admit to losses, as in forced to write off bad Greek loans. This caused a bank run and capital controls were put in place, violating the foundation of the Euro, that within the currency no capital controls shall be used. Initially Cyprus asked a sum of €17 Billion to bail out its government and banks. The plan by the EU Troika was to put a levy on Cypriot failing banks, which meant everyone must take a loss, including insured depositors, since the ECB wanted the loan to Cyprus government (who would give it to banks as bailout) to be secured. This did not go well since insured deposits are to be protected in accord with modern banking. Instead the Cypriot failing banks got nothing, while the Cyprus Government gets the €10 Billion bailout with harsh consequences. Cyprus is only getting €10 Billion to bail out the Government, where €7.5 Billion of the €10 Billion will go to re-finance maturing bonds held with the ECB, all while the loan is provided by the ECB. This results to the ECB kicking the can down the road, for someone else to deal with in couple years. The financing for the banks has to be found elsewhere (taken from uninsured depositors). The fact EU let the banks fail, along with EU Finance Minister's comments that Cyprus is a template for rest of Europe, has scared depositors elsewhere in Europe. Bank crises from now will likely hit uninsured depositors, who are now looking to move their money into safer locations. This has caused cash outflows from the World's oldest bank, Italy's Monte dei Paschi di Siena (MPS), who is in trouble with 2x bailouts already completed, and Slovenia who is currently denying need for help, even though the math says different. Cyprus initially wanted €17 Billion in financing. That's 9 trucks full of €100 euro bills. 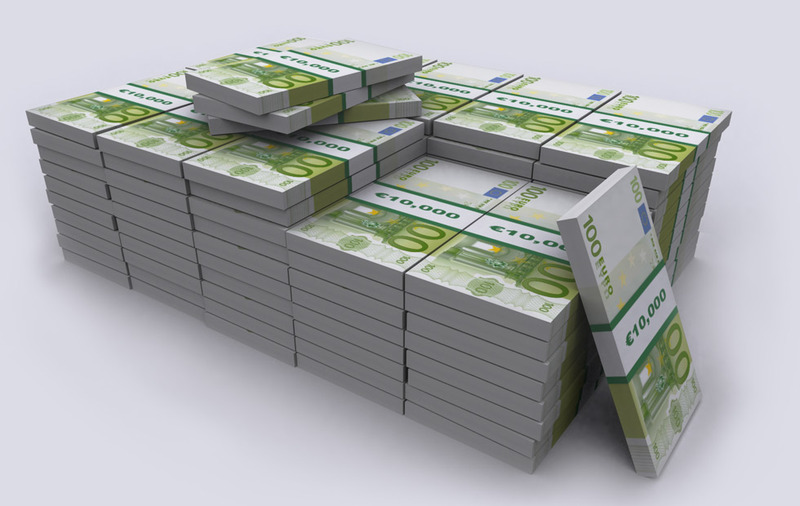 Cyprus bankrupt Banks have (had) a lot of wealthy Russian and British customers. Once the banks closed due to insolvency, the branches of Cyprus' bankrupt banks were left open in Britain and Russia, enabling its foreign customers to withdraw money while Cypriots could not. Many of the people that will get wiped out by the crisis will be ordinary people who had savings over €100,000 and small Cypriot business' who find themselves with zero cash. 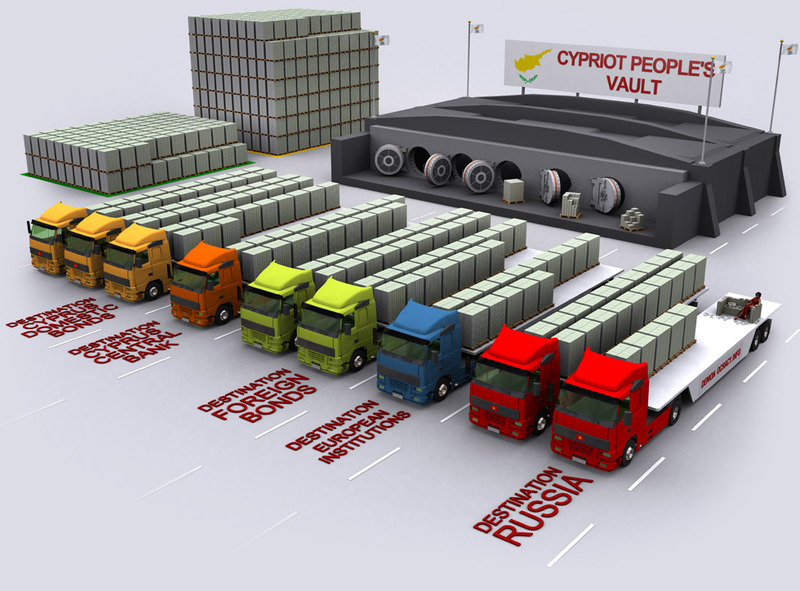 An unofficial reason for EU to oppose bailing out Cyprus banks was the large Russian cash hoard at Cyprus banks, and bailing out the banks would also bail out rich Russians with German money. As the Cyprus economy spirals down, Cyprus will likely need another bailout. while Cypriot Banks were on lock-down. to withdraw a lot of money outside Cyprus. The big depositors will get hit harder than expected, because a lot of money left the banks right before the banks went into lock-down. Cyprus' Banks are the first during the last 147 banking crises that will not get a single Euro from EU to bail out the banks. Greek branches of Cyprus banks had €15 Billion in deposits, they were sold last minute to another bank, by so they will not be included in sharing the losses- obviously suspicious. Some people are offering depositors to get their money out of Cyprus for a 20% fee. Cyprus officials are throwing around slogans such as "time for responsibility' (to pay up) just to turn around a week later and oppose it. With the lack of backbone, the next political move is rather unpredictable. EU officials say Cyprus is a unique case, but EU has many countries with over-sized banking sectors. The crash of Cyprus financial sector and government bailout sentences Cyprus to a long period of recession and debt. The list of demands by EU to Cyprus for accepting the €10 billion bailout includes things such as freeze on pensions, massive tax increase on just about everything and more taxes. Banks in Russia and UK that stayed open. millions out of the banks days before crisis started. withdrew € millions from the banks before they collapsed.